Sunday Pasta: Baked Gnocchi Parisienne. – romi, kilo india delta. 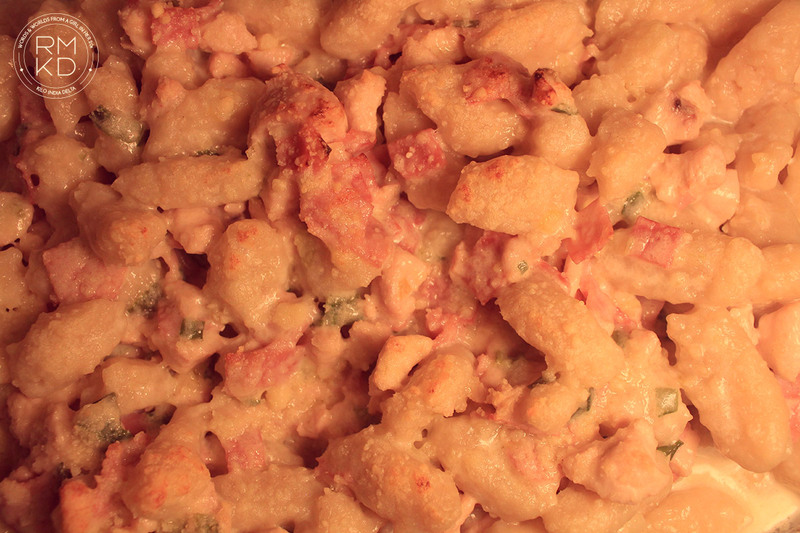 Sunday Pasta: Baked Gnocchi Parisienne. In Argentina, November is one of the hottest months of the year. With cold temperatures, constant raining and Ella Fitzgerald playing in the background, there’s only one thing I want to do. That is cooking pasta, of course. My family comes from Italy, and cooking pasta is a sacred tradition that goes way back. I remember being 4, in my kitchen with my dad and my sister, cutting gnocchi that my dad was preparing for the whole family. And my mom always says I’m just like my dad: I can get home after midnight, but if I’m craving homemade pasta, God knows I’ll put my apron on and start kneading. I chose to start with this recipe, a favorite one of mine. I made the gnocchi from scratch, but it’s also fair if you choose to buy a 500 g pack and focus on the sauce. To be honest, it was so humid the day I made them that I decided to buy a box of them just in case. It’s so hard to knead pasta manually when it’s raining/humid! But I’m saving to get a KitchenAid, and when that happens, you’ll be blasted with a thousand recipes. Wash the potatoes thoroughly. Leave the peel on so they won’t soak in water while being boiled. Put in a pot with cold water and salt, and wait until they go soft. You should be able to stab them with a knife with ease. Once they’re ready, it’s action time. 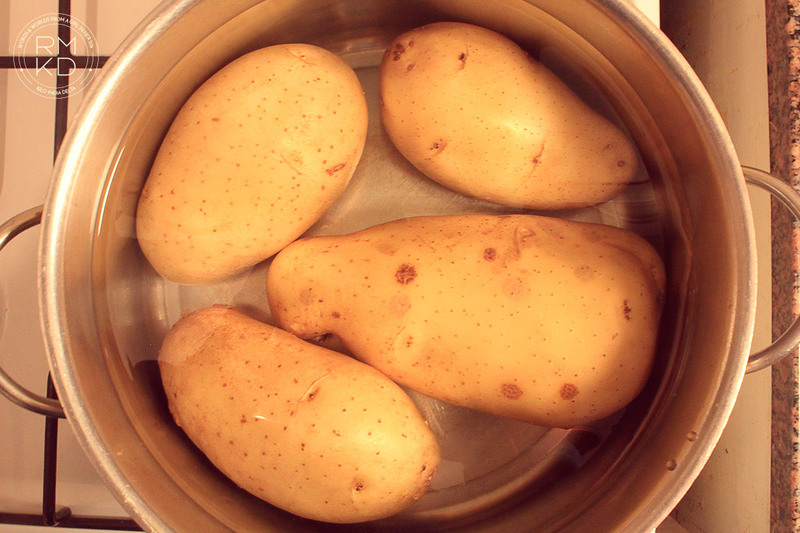 You need to do this fast, because if the potato loses the temperature, it will get hard again. Peel it using a fork and a knife. Mash them thoroughly (no lumps!). Then, add the cornstarch and half of the sifted flour. Add the eggs, salt & nutmeg at taste, and start kneading with patience. 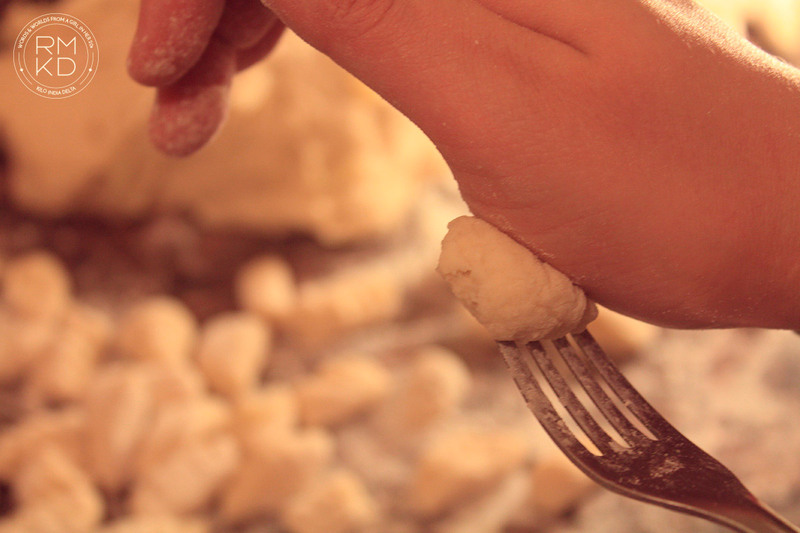 You can add more flour as the dough needs it, you’ll need to obtain an homogeneous, elastic dough. It will be ready when it’s dry to touch, after about 5-8 minutes of intense kneading. Then, cut fist-sized balls of dough and roll them to form a dowel, and cut slices of about 1 inch each (2,5 cm), flickering them with a fork – this will give their distinctive shape. Repeat until you have a counter flooded with these bad boys. In a pot, brown the butter and toss in the minced garlic clove along with the diced chicken breast. 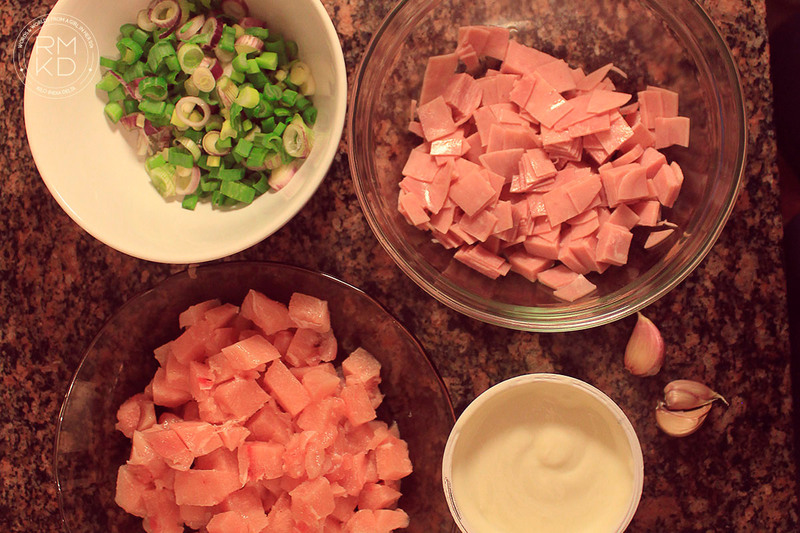 Make sure the chicken is cooked evenly before you add the scallions. After a few minutes, toss in the ham and mushrooms. After a few minutes, add the heavy cream. Condiment to taste. Is that easy, really! Then, cover the pot with a lid and set the temperature to minimum. We want it to thicken a little bit. 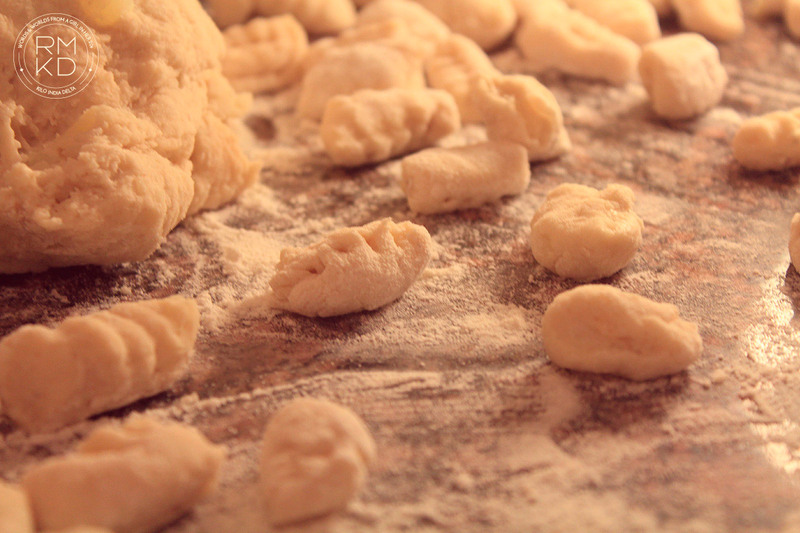 In the large pot with boiling water, add all the gnocchi you’ve made. Make sure the pot is large enough, you don’t want them raw. Once they start making their way to the top, remove the water and put them in a large glass baking dish. Pour the sauce on top, stirring well to make sure it reaches all of the pasta and you don’t have “dry spots”. Grate some parmesan cheese on top and to the oven! Only 10 minutes and voilá! An amazing, delicious dish to warm up the coldest November in 50 years. Are you ready to give it a go, or two? I can’t wait to read your comments or see your pictures! I have many other Pasta recipes ready to be enjoyed, and I want to share them with you! So stay tuned to Kilo India Delta and let’s hope for a cold, cozy winter ahead of us. Pingback: Spaghetti Carbonara, Cordoba Style. – romi, kilo india delta. Pingback: Sunday Pasta: Corn Cannelloni | romi, kilo india delta. Pingback: Sunday Pasta: Spaghetti with Prawns and Arugula. | romi, kilo india delta. Looking so lovely.. When I’m back to my kitchen I’ll try this recipe! Yum, gnocchi. We made our first batch a couple of weeks ago, and I was surprised because I didn’t realize how many potatoes actually went into te recipe. We’ll definitely be trying yours next. It’s usually one potato per person. ← #TBT: Recipe for Disaster.